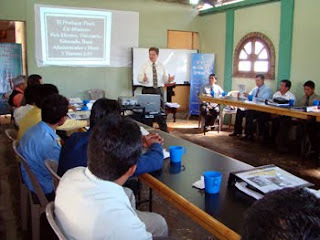 From Brad and Regina Thompson (Guatemala): In the UPC of Guatemala, July is the month of the Bible School. As part of the celebration all our national churches, celebrated a day of fasting and prayer this past Sunday. Our focus was to pray for the students, teachers, administration and for a miracle of provision. The explosive growth of the Bible School has caused unplanned expenses, and we are needing to erase our deficit. Monday morning I had an email waiting for me from a brother in the US. He had contacted me a few months back concerning a possible investment in the Bible School. He said that Sunday night I appeared to him in a dream, telling him to give the money to the Bible School! The very night of our prayer and fasting God began opening the windows of blessing for our school! This coming Sunday all of our national churches will be taking up a sacrificial offering for our Bible School. Pray with us that God would open hearts to invest sacrificially in our Bible School program. With 363 students enrolled this year we are experiencing a great harvest for ministry. From Terry McFarland (Rep. of Ireland): Please pray for my brother Randy McFarland, as I just received a message that he had a stroke. From Stanely Scism (South Asia / United Kingdom): Please continue to pray for a son of John Harvey in Hood River, OR. One of the two sons, John Jr, is fine. The other son is in a coma and with brain damage. God can heal this just as well as he can heal anything else. Let's pray. From Brother White (Malaysia/Indonesia): Please pray for Brother Samuel (Malaysia General Secretary for many years) who is having heart by-pass surgery in Kuala Lumpur on Friday. He had recently gone through a procedure hoping that stints would take care of the problem, but it was determined that open-heart surgery was necessary. At the National Heart Hospital here, the first opening for the surgery was not until December. However, through prayer an opening has been made for him to have the surgery this week. From Brad and Regina Thompson (Guatemala): Please continue to pray for Guatemala. We are still being hit with an overabundance of rain. This last weekend we had several additional mud slides. This afternoon the volcano erupted again, throwing ash and lava over 1000 feet into the air. Yesterday two of the main roadways in Guatemala City were blocked due to the bombing of a bus. Thank you to all who have been praying for the church in Guatemala and for our country. Please continue to hold us up in prayer.